Key Difference: The primary difference between a tide and a current is that the term tide refers to the rise and fall of the water levels, caused by the gravitational pull of the moon and sun, whereas the current refers to the flow of the water,caused by a variety of things, such as but not limited to wind, the Coriolis effect, breaking waves, cabbing, temperature and salinity differences. Tide and current are often confusing as they both depict movements in bodies of water. The terms are most commonly associated with a sea or ocean. However, the two are completely different things. The primary difference between a tide and a current is that the term tide refers to the rise and fall of the water levels, whereas the current refers to the flow of the water. They also differ through the way they are created and controlled. The term tide refers to the rise and fall of the water levels. This rise and fall is caused by the gravitational pull of the moon and sun, as well as the rotation of the Earth. This movement exerts direct pressure on the water bodies, causing the water levels to move inland which results in the rise and fall. The current can be caused by a variety of things, such as but not limited to wind, the Coriolis effect, breaking waves, cabbing, temperature and salinity differences. The current can also be impacted by the gravitational pull of the moon and sun; however, they are not the primary reason for their formation. Ocean Currents can be compared to wind, which move about over the surface of the water, except that the current occurs below water. In fact, wind is one of the primary causes of ocean currents. The term tidal current refers to current which is created due to the tide. These often occur near the coast such as in oceans, near the shore, and in bays and estuaries along the coast.These tidal currents are the only type of currents that change in a very regular pattern and can be predicted for future dates. Other currents can be cause by a variety of factor and are not predictable. Another difference between a tide and a current is their durations. Tides change daily, some shorelines experience two high and low tides a day, which is called a semi-diurnal tide. However, most shorelines experience only one high tide and one low tide a day. 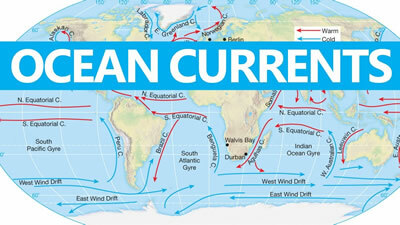 Ocean currents change less frequently, in fact major changes only occur seasonally. The change in temperature as well as wind leads the current to change and shift. Drastic changes can cause major damage and can even result in hurricanes.